If you were to drive an hour west of Terrace and take a boat across the Skeena, you might find a few abandoned buildings and the posts that once supported wooden streets — all that remains of a once bustling fishing community. Today, Port Essington is a ghost town, but it wasn’t always that way. Over the course of its history, Port Essington has been a fall campground for the Tsimshian First Nations, a European trading post, a seasonal employer at multiple canneries, and the site of the forced displacement and internment of Japanese-Canadians during World War II. Port Essington was founded in 1871 by Robert Cunningham, a former trader for the Hudson’s Bay Company. Though the area had long been used as a fall campground by members of the Tsimshian First Nations (who called it “Spokeshute,” now the name of a nearby mountain), Cunningham encouraged them to settle there permanently. After purchasing the land from the Canadian government, Cunningham set aside a portion for First Nations’ use, selling the rest to European settlers. 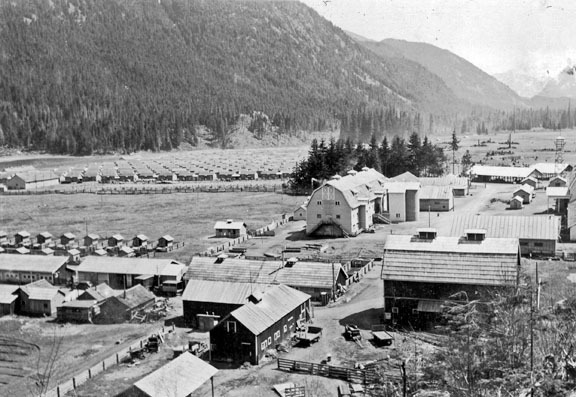 By the 1890s, Port Essington had two canneries, a hotel, sawmill and town hall, and was used as the main entrance point to the Skeena River. The region’s booming fishing industry attracted Port Essington’s first Japanese settlers, Shiga Aikawa and Yasukichi Yoshizawa, in 1890. Though many of the community’s residents migrated south at the end of the fishing season, Port Essington had a permanent population of several hundred white settlers, Tsimshian First Nations, and Japanese fishermen by the turn of the twentieth century. 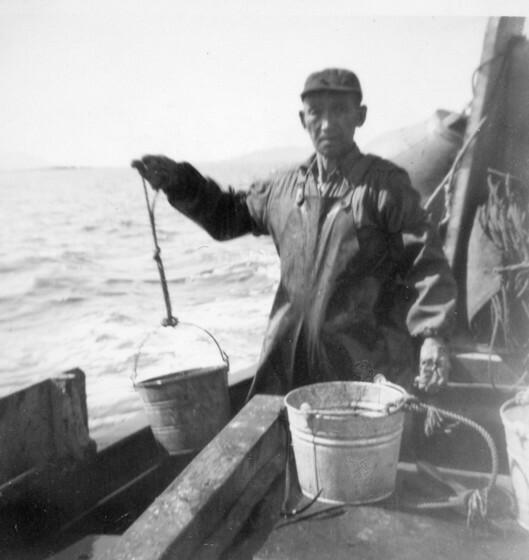 The Japanese community thrived; by 1910 Japanese Canadians owned three quarters of the 1000 regional fishing licenses. Port Essington had a Japanese language school with 54 students in 1934, and the Skeena Buddhist Temple. Japanese Canadians achieved economic success despite continuous attempts to exclude them from public life. Federal policies restricted Asian people from many professions, denied them the right to vote, and allowed employers to pay them far less than their white counterparts. Asian Canadians faced widespread discrimination, both institutionalized and violent. In 1907, a white mob attacked Chinese and Japanese neighbourhoods in Vancouver, smashing windows to protest Asian immigration. In March 1942, Mackenzie and the federal government began rounding up people of Japanese descent. They were only allowed to bring one suitcase per person to the designated holding areas where they waited — sometimes for months — for the trains that would carry them to work camps in the province’s interior. Hastings Park in Vancouver, now the Pacific National Exhibition grounds, was one such holding area. Once Japanese residents were forced out of their communities, their property was confiscated by the Custodian of Enemy Alien Property. This included 1200 fishing boats that were seized by the Royal Navy. In 1943 the government sold the seized property, returning a small shareof the profits to the former owners to pay for their internment. All this was despite the fact that RCMP officials said it was extremely unlikely that Canada’s Japanese population would be involved in any kind of sabotage. But these assurances did nothing to stem the tide of racism, and the fear of another military attack, which had overtaken BC’s coast. When their trains arrived, families were separated; the men joined road crews in the interior while women and children were sent to shantytowns in the BC wilderness. In order to stay together, some families agreed to travel as far as Alberta and Manitoba to work on sugar beet farms. Approximately 6000 people were also deported to Japan, despite the fact that many were naturalized citizens or Canadian-born. Fifty deportees gave their previous address as the Skeena River, and fifteen were from Port Essington. Among them was the Tamaka family — Iwakichi, Masuye and their two children, twelve year old Kiyoshi and eight year old Iwao, both born in Canada. The family was interned in Slocan, BC before being deported. In total, over 21,000 Japanese Canadians were forcibly displaced. Even after the war, they were not allowed to return to British Columbia but were forced to relocated to either eastern Canada or war torn Japan. It wasn’t until 1949 that Japanese people were once again allowed to live anywhere in Canada and were granted the right to vote. Survivors and the descendants of internees organized in the 1980s to demand redress. The movement prompted Prime Minister Brian Mulroney to issue a formal apology in 1988. Survivors received compensation packages of $21,000, though some had lost millions of dollars in confiscated property. The loss of its Japanese residents was a devastating blow for Port Essington. The town had been in decline since the Grand Trunk Pacific railroad, completed in 1914, was built along the north side of the Skeena River and bypassed Port Essington. By the 1940s, all of the town’s canneries had shut down and few residents remained. Fires in 1961 and 1965 destroyed the few remaining buildings and, unlike after previous fires in the area, no one chose to rebuild. In 2017, Port Essington was recognized as one of 56 Japanese-Canadian Historic Places by the provincial government. Though little remains of the once bustling fishing town, memories of injustice live on. Erika Loggin is a recent graduate from Simon Fraser University and will be continuing her studies this fall at the London School of Economics. She is the current Collections Researcher at Heritage Park.